There are 2 ways to get the files you need to create your Windows Install Media. 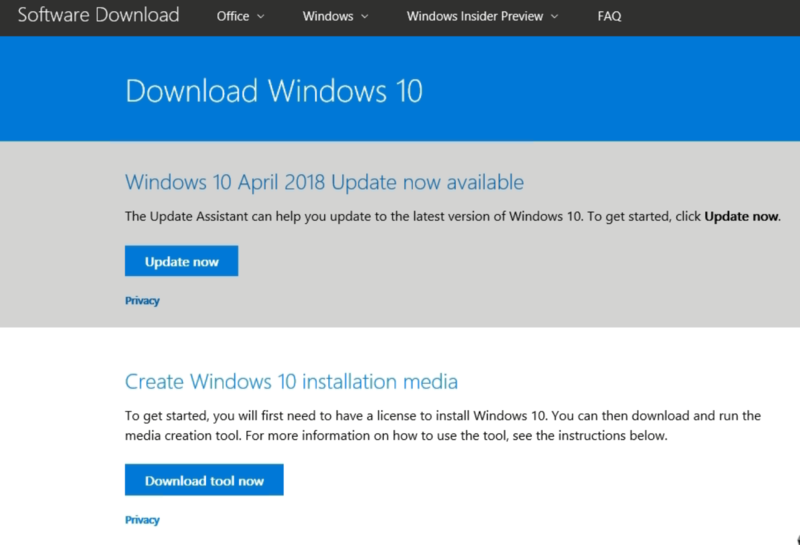 You can either go through your manufacture (IE – Dell, HP, Lenovo, Acer, etc) or you can get the Windows Install Media from Microsoft itself. My preference is to go the Microsoft route because (1) some manufactures don’t offer a way to download what you need and instead make you pay for the media (I’m looking at you Acer), and (2) the download from Microsoft is just Windows. The Microsoft version does not include any of the junk trial software that the manufactures usually add. Two things to keep in mind before we go over the actual steps. 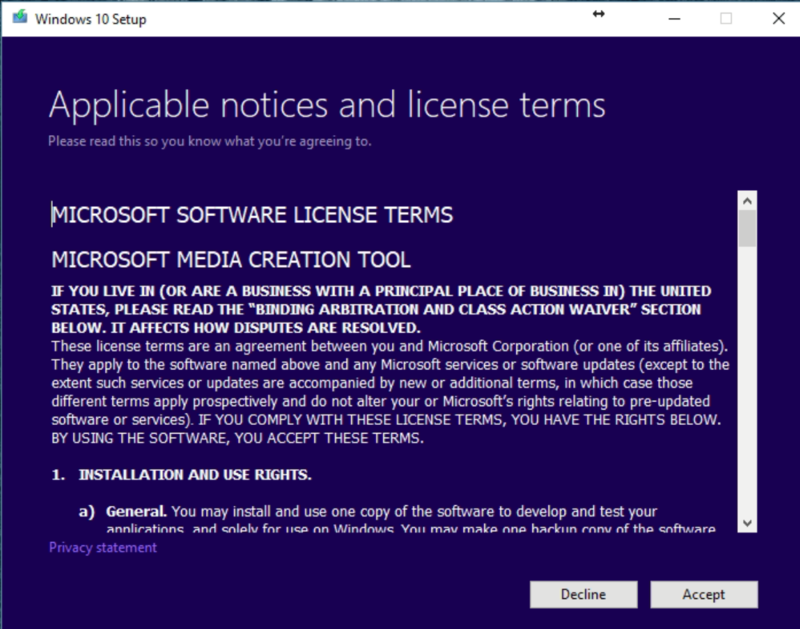 This Windows Install Media does not come with a product key. You MUST know your product key. If you don’t know your product key please read the recent post Finding Your Software Product Keys In Windows. 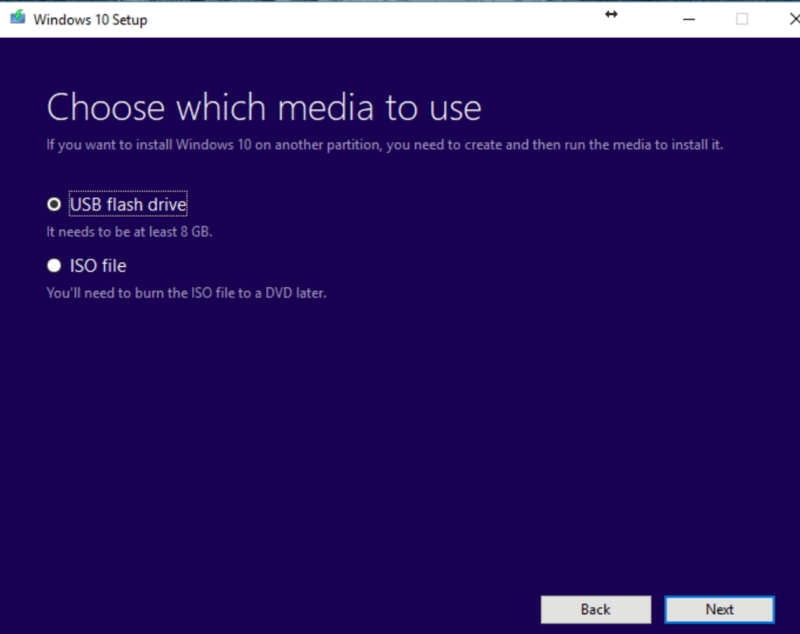 The Windows Install Media from Microsoft can be set up on either a USB thumb drive (of at least 8gb) or a blank DVD. To get the Windows Install Media you will need to set up the Microsoft Media Creation Tool. To get started from your browser, go to the Download Windows 10 website. Scroll down on the page until you see the button labeled Download Tool Now. The website will ask you to download an executable file called MediaCreationTool.exe. You can click run or save (then run) depending on the browser you are using. Once the Media Creation Tool starts to install you will see a message that it is Getting a few things ready. This should take a min or two and then continue automatically.Note When you click run, if you get a prompt from the User Account Control (UAC) asking if you are sure that you want to run this app, make sure to click YES. Once its done getting a few things ready, you will get the 1st screen that will ask you to Accept its license terms. Just click on the Accept button to continue. 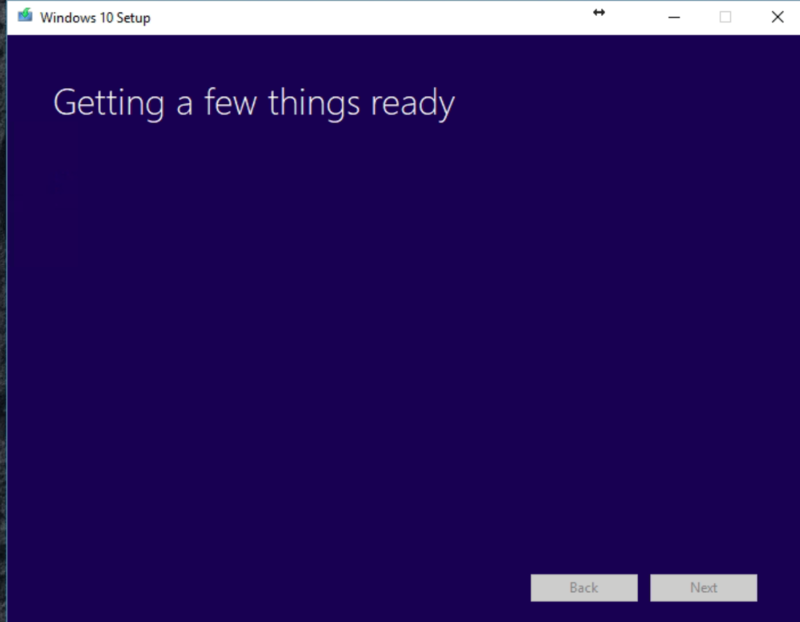 On the next screen you will see a prompt asking whether you want to upgrade your current PC, or if you want to create installation media that you can use to install Windows 10. Since this post is about creating Installation Media, select the 2nd choice on the list to create installation media and click next. At this point, you will get the Language, Architecture and Edition screen prompt. If you are making your Install Media on the pc that you are creating the back for, you can use the “Use the recommended options for this PC” meaning that the Media Creation Tool identifies the characteristics of your current Windows 10 and uses the same for creating the installation media. 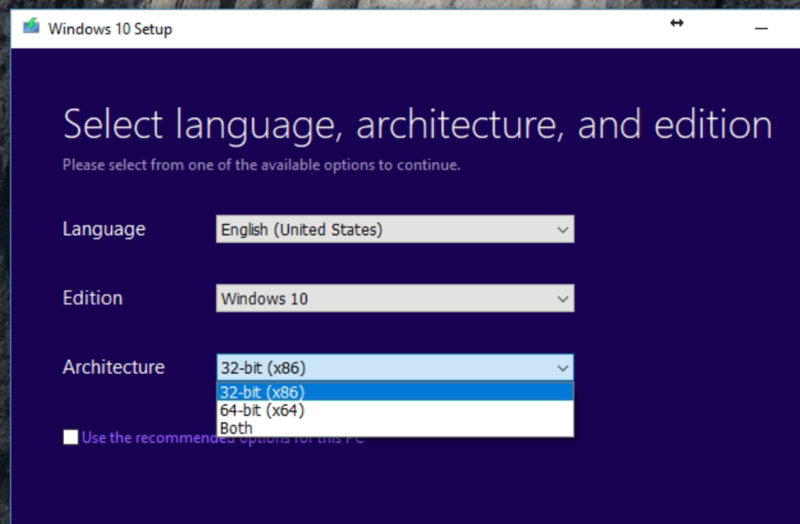 If you a making install media for another machine, uncheck the Use Recommended settings and then select if you want 32 bit (x86 Windows), 64bit (x64 Windows) or if this back up is for multiple machines you can select both. In either case just click Next after you make the selection. 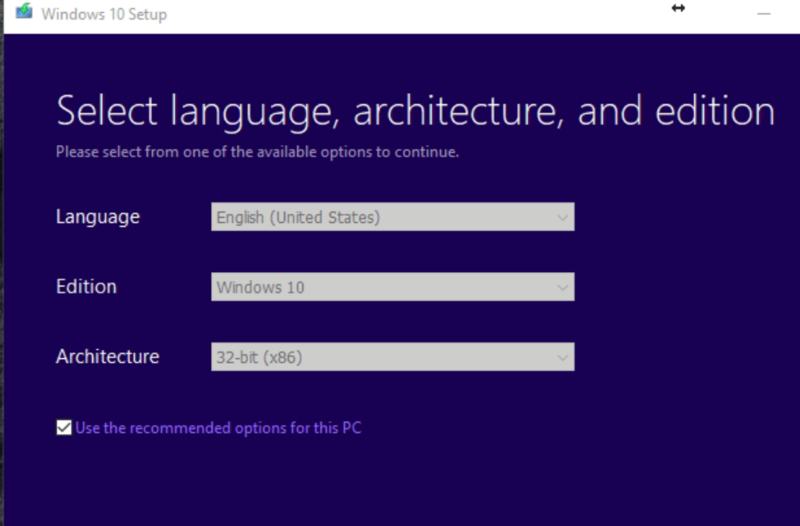 NOTE: Yes this is also where you can change the language of your install, for those who use something other than English. You will now get asked if you want to create the media on a USB drive or if you want to download the ISO file that can then be burned to a DVD. We will start with the steps for a USB flash drive. At this point install your USB drive and then click next. 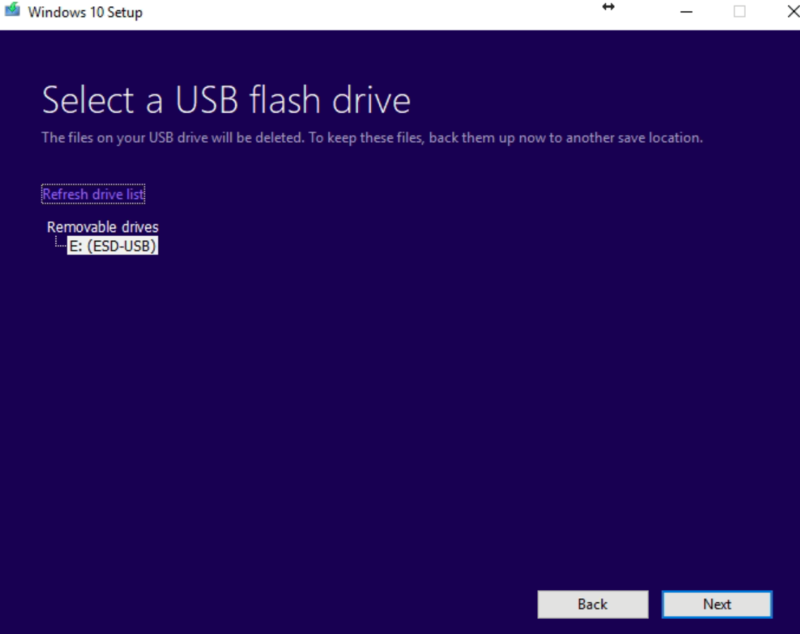 If you plugged in the USB stick into the pc before you clicked next on the previous screen then should see the USB drive listed. If you didn’t plug it in yet, go ahead and plug it in now and then select Refresh drive list. Keep in mind that any data on the selected drive will be wiped, as the tool formats your drive, so if you have more than 1 drive listed, make sure you select the correct drive to install Windows on. This is the point where you just have to watch the screen and wait for the progress to complete. The Media Creation Tool will download the files and install them on your USB drive. 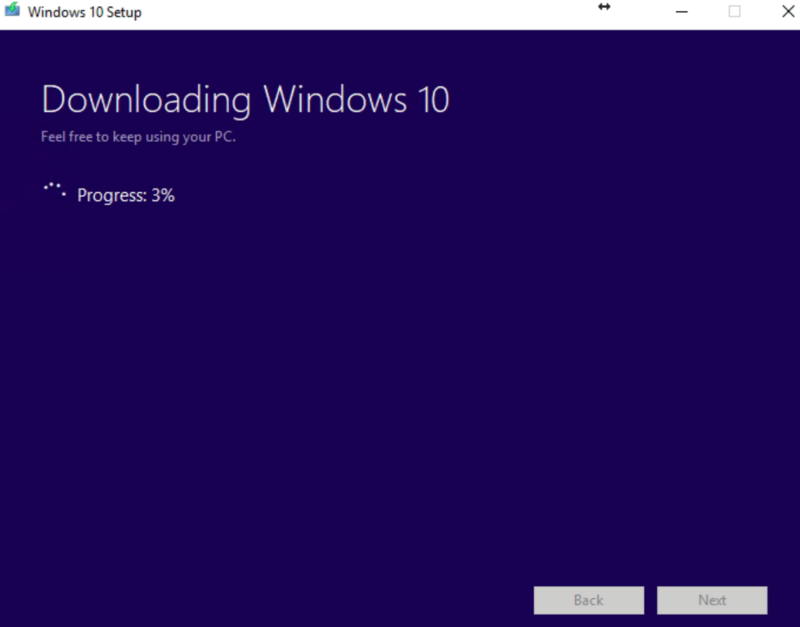 Since the Windows install files are almost 4 GB in size, this might take a while. All you need right now is patience. Once the process is complete, the screen will show Your USB flash drive is ready. Click Finish, and you now have your Windows Install Media ready. For those who prefer DVD, installed of USB flash drive, on the screen that asks you to Choose which media to use, change the setting to ISO file. When you select Next, you will get a prompt to save the ISO file. Just make sure you know where the file is saving. Once the file is downloaded, you can use the ImgBurn app to create your DVD media. If you don’t have a copy of the ImgBurn software, its free and can be downloaded from Ninite. Once ImgBurn is installed and the ISO is downloaded. 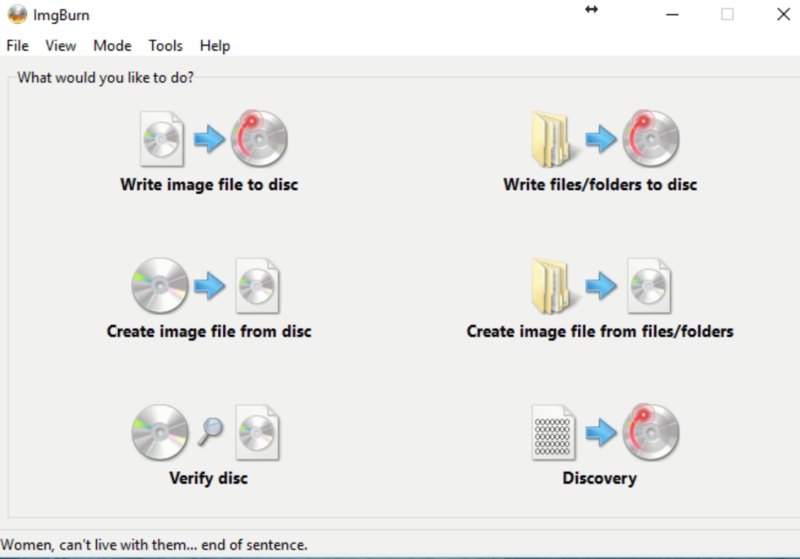 Open ImgBurn and select Write Image file to disc. 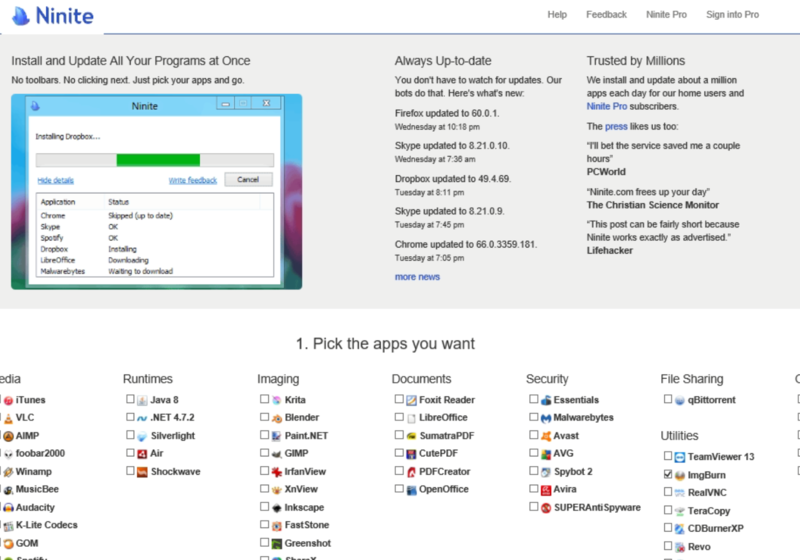 On the next screen, (towards the top) select the folder and then select the downloaded file. Now insert the blank DVD in your pc’s dvd drive, and lastly click the icon (lower left) that shows 2 CDs with an arrow in the middle. This will burn your DVD file. 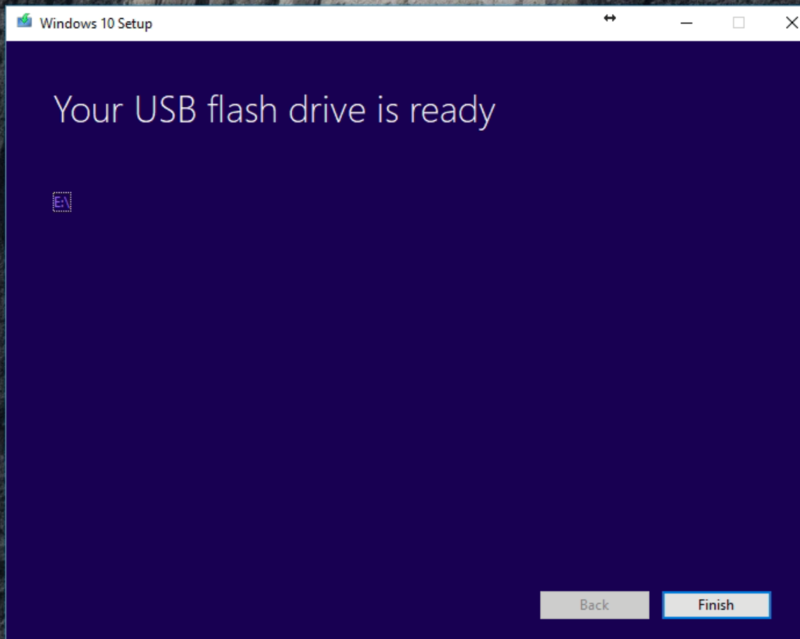 That’s it, you should now have either a USB drive or DVD with a bootable copy of Windows 10.